Business results are enormously affected by employee’s behavior: see your role in managing training as changing behavior to get business results, not just get folk through courses of doubtful utility. The optional training is probably useless. Your most important role is probably selection: making sure that the selection process is rigorous so you don’t hire or promote the wrong people. Unfortunately most of your line management are not good at this. Improving the selection processes and leaders’ skill to pick good people (and themselves pick good pickers below them) is your job and has huge returns if done well. Another key focus for you should be helping people grow: my friends laugh when I suggest that HR has any interest in this. But at a fundamental level, what else are you for? Helping people grow is also very satisfying though you have to grow too. It is best to get rid of poor performance cases early in their career; your role should be to ask who is not performing, and then try to up skill them, refit them within your organization or let them go. But you have to make sure this is not some management whim or prejudice. You need to learn from your mistakes and not ex-post rationalize them as Dilbert’s boss and Catbert are so good at. And to make my point, here is a story of an anti-Catbert HR person: a story of what one of the people who once worked for me recently did. Chris was the senior Human Resource Director for a major business unit of a large company. He was concerned about the team behavior of his clients: the senior line management of his organization. He arranged they all go to a weekend off-site meeting with skilled organizational development (OD) professionals to work more strategically as a team. On the Monday following the off site, the Senior Leader returned to work full of enthusiasm and called Chris to his office. He told Chris the weekend had been a fantastic success and the leadership team had come up with a bunch of new values and behaviors they wanted everyone in the organization to adhere to. He asked Chris to get with the internal communications department to deploy the new approach to all 50,000 employees in the organization within 10 days. The boss was silent and did not repeat his request. When HR takes stands like that it has moved beyond Catbert and got some guts. 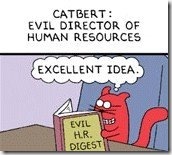 This entry was posted in Conflict Humor, Conflict Processes, Economic Conflict, Top Ten Conflict Tips from Great Thinkers, Ways to handle conflict and tagged Catbert, Dilbert, evil HR, evil HR directors, how HR can avoid being evil, not Catbert HR, top ten conflict tips. Bookmark the permalink. I thought it was heading to be some boring outdated post, but it really compensated for my time. I will post a website link to this web page on my blog. I’m certain my site visitors will find that really useful.